In 1944, Homi Jehangir Bhabha, the founding father of India's atomic energy programme, had said: "Any substantial rise in the standard of living in this region... will only be possible on the basis of very large imports of fuel or on the basis of atomic energy." How right he was. Today, India imports 76 per cent of its petroleum requirements, nearly 20 per cent of its thermal coal and 19 per cent of its natural gas needs. Despite this, its power deficit is in the double digits. Bhabha's option - atomic energy - languished and became possible in a big way only after the US-India Civil Nuclear Cooperation Agreement of 2007, which helped India get access to fuel and technology from the Nuclear Suppliers Group. India had been blacklisted for decades for testing a nuclear bomb and refusing to sign the nuclear non-proliferation treaty. After the agreement, the government began talking of increasing the installed nuclear power capacity from 4,780 MW to 20,000 MW by 2020 and 60,000 MW by 2032. And Nuclear Power Corporation of India Ltd, or NPCIL, formed in 1987 by the government with the mandate to manage India's atomic power plants and set up new ones, is on a high. Chairman and Managing Director S.K. Jain was once a harried man who had to ration scarce fuel to NPCIL's many nuclear plants and run them at half the capacity. Jain recalls he had to appeal for the survival of existing reactors while commissioning a new one. "I said: 'I already have 18 children, four are without food, and one more has been added.' We were operating our reactors at 41 per cent of their total capacity." Today, technology and fuel restrictions are things of the past and Jain has a problem of plenty. Funds are not a worry, because anybody who wants to get into nuclear power has to make NPCIL a 51 per cent partner and will bring in the money. By March 2012, NPCIL will have increased capacity to 6,780 MW, including two 1,000-MW reactors being built with Russian help at Kudankulam in Tamil Nadu. It has also announced plans to set up clusters of reactors at Jaitapur in Maharashtra, Kovvada in Andhra Pradesh, Haripur in West Bengal, and Mithi Virdi in Gujarat. Partnerships with other public sector units or foreign and Indian private companies will be key to NPCIL's growth. One set of partnerships is with foreign suppliers of technology for reactors. The other is with Indian companies who are ready to invest in nuclear power projects. For technology, NPCIL has signed agreements with Areva of France, GE Hitachi Nuclear Energy and Westinghouse Electric of the US. Russian companies will also help build six reactors at Haripur in West Bengal. Areva is helping it at Jaitapur. 'Help' is the key word: "We don't want turnkey projects as we are not novices," Jain says. NPCIL has the expertise to build reactors of 100 to 540 MW capacity, and needs foreign technology and cooperation only for the larger ones. "A 1,000-MW reactor can run for a year on 30 tonnes of uranium. So the amount of fuel needed is much less than in other sectors. Also, when fuel is consumed it produces more fuel, which can be used to increase capacity," he says. Supplies should not be a worry as long as current political agreements hold. NPCIL has not sought budgetary support from the government since 2005/06, and hopes it will not have to do so till the end of the 12th Plan, in 2017. It will fund its expansion by forming partnerships with public sector giants such as NTPC, Indian Oil Corp and National Aluminium Co, and expects to have one with Oil & Natural Gas Corporation soon. "Each of these companies is ready to invest `10,000 crore," says Jain. Bhardwaj, tipped to take over from Jain next year, says it was Jain's idea to form these joint ventures, and also diversify into renewable energy. "It is his vision that we diversify to other sources like hydel, wind and solar," says Bhardwaj. Jain also roped in Larsen & Toubro to make steel forgings that were earlier being imported. So far, L&T is NPCIL's only private partner. While any company can form a joint venture with NPCIL to set up a nuclear power plant, so far only governmentowned companies have been allowed into the sector. Would private players be able to steal NPCIL's thunder when they come in? "Nuclear technology does not have an exit route. It is like the holy cow for the Hindus: you have to feed it whether it gives milk or not, until you bury it. So, private players need to understand that their responsibility extends beyond profitability," says Jain. Commenting on NPCIL's ambitions, Kameswara Rao, leader of the electricity, power and mining at PricewaterhouseCoopers India, says: "It is an aggressive plan, but achievable with support." According to Rao, Indian private sector players may not be able to bring in as much expertise and knowledge as NPCIL, but the business is attractive. "It is a fixed asset that continues to pay without having to add capacity," he says. For the moment, nuclear power has again become a sensitive issue in the public mind, following the crisis in Japan in March this year, in which the damage caused by an earthquake and tsunami led to a meltdown at the Fukushima nuclear power plant. As Jain says, "On March 10 we were heroes. Chief ministers of every state were approaching the Prime Minister to get us to set up a nuclear power plant in their state. The next day, our performance and record were overshadowed by an incident elsewhere." Fukushima also sparked a global review of nuclear safety procedures and calls for an independent regulator whose mandate is not to promote nuclear energy. But concerns about safety is not the only hurdle nuclear projects face. Jaitapur, where the villagers fear the loss of their livelihood, is a more complex issue: can nuclear power spur growth and development? Jain, who has spent a lifetime at power plants in remote areas, says: "I have lived at several plant sites in floodlit colonies equipped with modern amenities, while the people on the other side lived in darkness and deprivation." PwC's Rao sums up the argument: "Renewable energy sources are technologically some distance from setting up large capacity units. Till then, the gap will have to be filled by nuclear power." 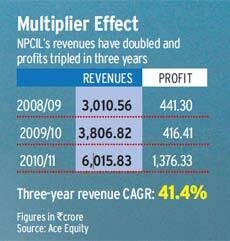 Either way, NPCIL stands to gain the most.